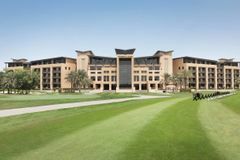 The Westin Abu Dhabi Golf Resort & Spa is the hospitality heart of the Abu Dhabi Golf Club which is one of the finest in the UAE, boasting an 18-hole championship layout, home to the European Tour Abu Dhabi HSBC Championship. In addition to The National Championship Course, the 9-hole Garden Course can be played by day and night, offering a floodlit experience enjoyable for all standard of golfers. A convenient 15 minutes drive from the Abu Dhabi airport, this urban retreat is a refreshing addition to a city sprawling with glass and steel structures and offers guests the chance to enjoy first class accommodation, multiple dining options, various leisure facilities as well as one of the finest golf courses to be show cased on the European Tour. Abu Dhabi Golf Club offers 27 of the finest holes you can hope to play in the entire Gulf region. In fact the course is now a mainstay on the European Tour with the HSBC Abu Dhabi Golf Championships returning here year after year. The Championship Course is a tranquil oasis carved out if the desert and at 7,334 yards from the back tees, it is more than long enough to test talented golfers. Perfectly manicured fairways weave their way through undulating terrain that features native palm trees, decorative plants and shrubs and seven salt water lakes. Generous greens are well protected by strategically placed bunkers so well struck shots from the fairways are a must. For those looking for a more relaxing round of golf there is also a par 36 nine hole track which is also a great place for beginners to begin their love affair with the game of golf. From Deluxe Rooms to the lavish Presidential Suite, visiting golfers can enjoy accommodation of the very highest order. Accommodations feature stylish, contemporary décor and a whole host of modern amenities that will ensure the Abu Dhabi Golf Resort & Spa is a home away from home during your golf break in the Middle East. Each room features 42” LCD TV, wireless internet connection, on demand movies and media hub as well as signature Westin Heavenly beds and showers and private balconies that overlook the golf courses. Whether you're planning a relaxed evening meal with your golfing buddies or an intimate dinner for two, the Westin Abu Dhabi Golf Resort & Spa offers an impressive array of top class dining options. With gourmet chefs in six restaurants boasting dishes from every part of the world, as well as 24-hour in-room dining, the resort welcomes guests seeking to enjoy the finest cuisine in exceptional surroundings. Enjoy Moroccan fare inspired by the mystery and allure of Arabian nights at Agadir, a sophisticated meal in the Lemon & Lime Lounge or home comforts and pub grub in The Retreat. During time spent away from the golf course guests of the Westin Abu Dhabi Golf Resort & Spa can head to the Heavenly Spa for the ultimate in relaxation; perfect for recharging the batteries for another game of golf! A range of spa treatments and massage services are available so whether you're seeking to wind down after an exhilarating round of golf, looking to relax before an evening out or simply want to be pampered, the selection of massages and facials offer you the opportunity to embrace complete bliss. Bask in the warm glow of the sun, enjoy Saadiyat’s clean, warm turquoise waters or take a dip in the refreshing and picturesque pool at Saadiyat Beach Club. Nestled away on the island of Saadiyat, the club celebrates health and wellness, in natural surroundings and beautiful facilities. Complimentary access passes to the exclusive Saadiyat Beach Club (Limited passes available). From the hotel, a short drive takes you to the premier attractions in Abu Dhabi such as the Yas Island Circuit, Ferrari World and the grand Sheikh Zayed Mosque. Excellent accommodation and eating options, the comfortable beds are of particular note! The half board rate included an excellent buffet style dinner choice with cuisines from around the world. Just back from Abu Dhabi and have to say the Westin Hotel were a great base for the weekend. It is really close to the airport so nice after the flight. The hotel has great views over the golf course and its location is hard to beat. Would recommend it to anyone wanting some golf in the sun in a 5 star hotel.